Petit Bites Gluten-Free Chocolate Chip Coconut Nibbles are not your traditional coconut macaroon, and maybe that's why I might just consider it my favorite. They have a beautifully golden shell on the outside, and a soft and chewy coconut inside, mixed with enough chocolate chips to satisfy any chocolate lover. The best part is that I don't feel guilty after indulging in a few. They are made with only five pure ingredients (sweet potato is actually second on the ingredient list, but you'd never know) and are free from preservatives, trans fats and cholesterol. They are a must try if you love coconut and chocolate! 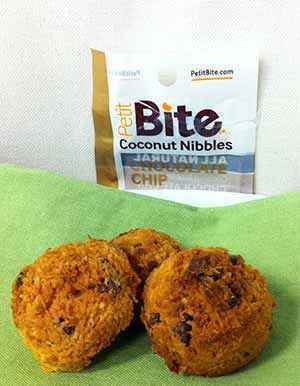 For more info visit their site: http://www.petitbite.com/#!products. Note: Articles that appear in the "Gluten-Free Food Reviews" section of this site are paid advertisements. For more information about this see our Advertising Page.